Contribution Restrictions: Signup Requirements: You MUST sign up by emailing nerdyhookers@gmail.com. You MUST include: ~ Your Name ~ Your email ~ Piece(s) you’d like to do ~ Whether you are knitting or crocheting Pieces MUST be done in GREEN worsted weight yarn, in knit OR crochet (flowers and garden creatures may be done in any color) Pieces can be done in any style you wish, so long as they meet the measurement requirements You MAY do more than one piece and any number of flowers / leaves / butterflies / birds / bees to be used for decoration of the gazebo. You MAY applique flowers / leaves / butterflies / birds / bees to your squares. Pieces MUST be completed and mailed by February 1, 2015. They must be RECEIVED by NO LATER than February 15th, 2015. Here is what we need: Use whatever gauge you need for measurements below. Measurements are in INCHES. 36 - 13.5” x 14.7” pieces 12 - 13.5” x 19.5” pieces 10 - 9.5” x 70” pieces 10 - 9.5” x 67” pieces 20 - 9.5” x 57” pieces 40 - 9.5” x 60” pieces 16 - 39.5” x 23” pieces 4 - word panels (to be assigned) 2 - 28” x 24.5” pieces 4 - 43” x 24.5” pieces 4 - 86” long flower garlands (4 links to patterns below) ? -flowers / leaves / birds / butterflies / bees, etc. as decoration for tops of pillars, flower box, railings, etc. (nice to have) - 43” long flower garlands. They will be washed, recycled and used in other projects benefitting project linus. First community mental health center in the US to celebrate 2015 mental health awareness day with yarn, color and messages of hope. How's that for a conversation starter? My name is Leslie DeHart. I currently work for Central Oklahoma Community Mental Health Center in Norman Oklahoma. We actually were the very first outpatient community-based mental health center in the country. We have rolled with all of the changes that have come through the system in the last 50 years and are ready to step into the future. We are undergoing a remodel of several buildings after they were damaged in storms a few years back. By next spring all of our building projects should be complete. 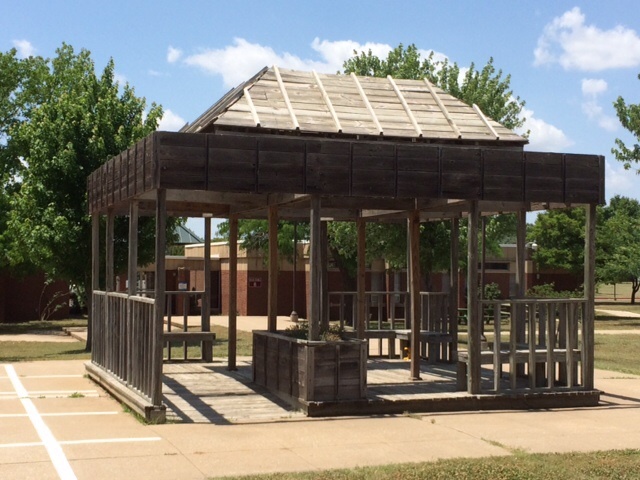 I have challenged the staff here as well as my friends in the crochet community to help me yarnbomb a gazebo that sits at the heart of our campus. We are going with shades of green because our psychosocial rehab group has named themselves Team GREEN (Growth, Recovery, Education, Empowerment, New Beginnings). We want to celebrate the movement of recovery and celebrate the people we serve.